Virgil Edwards waits for his breakfast of coffee and black beans to cook while sitting in one of the few rooms still standing on his property after the invasion several years prior. Virgil Edwards looks out over his land in San Cristobal de las Casas, Chiapas, Mexico, from an unused greenhouse. The greenhouse used to grow roses and chrysanthemum, until late 2012 when more than 500 people invaded his land for two months. 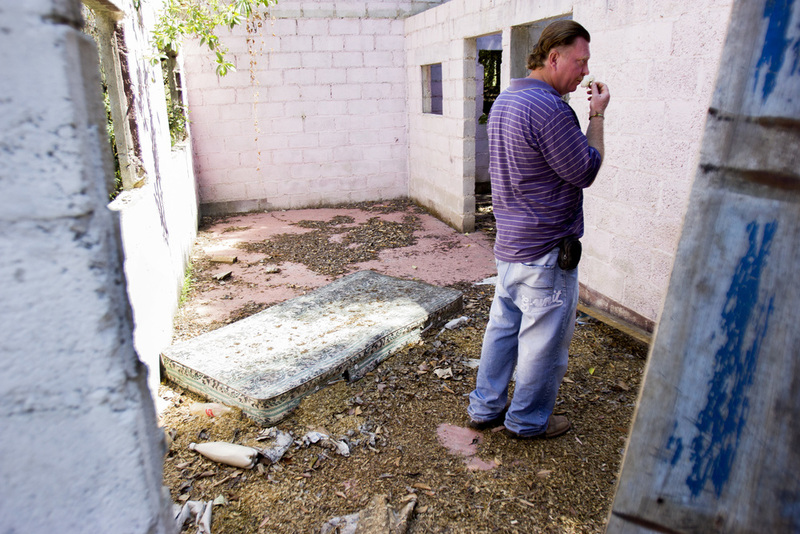 Virgil Edwards inspects what remains of a greenhouse that was built by his mother on the land. His parents bought the 25-acre Rancho El Ar 50 years ago and built it up out of the jungle. Virgil Edwards smells a rose and looks around the inside of a burnt-out home on his property that used to house a large family. The family fled in fear from the armed hundreds who tried to "reclaim" the land. Virgil Edwards reaches for the stump of a plum tree on his land in Chiapas, Mexico. The invaders destroyed buildings, cut down more than 1,000 trees, and covered the land in waste. Virgil Edwards carries a shovel from a storage room in his home while working on his land. An American citizen, Virgil moved back to San Cristobal de las Casas from New York City when he heard about the invasion and stayed to rebuild the land. Much of the work Virgil Edwards does on his land involves trimming trees to help them grow back. Edwards spent his youth here, and it's that connection which brought him back. There are dozens of holes across Rancho El Ar formerly used by the invaders for human waste. He will use this sand to fill a hole near the front gate. Virgil Edwards pushes his hair back after working for several hours in the heat and humidity of Chiapas, Mexico. Almost every day he prunes up to 10 trees, and he has a goal of planting 1,500 trees to make up for the ones he lost. Virgil Edwards washes his face after getting sawdust in his eyes from the half-dozen trees he trimmed that morning. He is alone in trying to rebuild the land — his brother lives in the United States and his neighbors remain wary of a future invasion.